There are some lovely pieces coming up for sale. At Christie’s on 19 March 2015, the Chinese art work in the collection of Robert Hatfield Ellsworth goes on sale. Five pieces are worth noting. 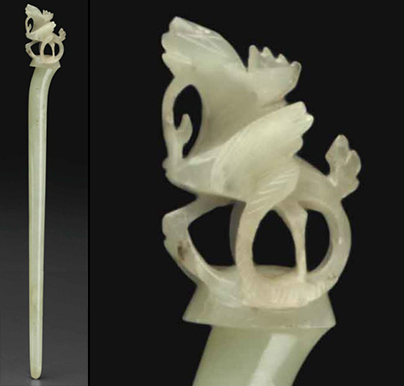 This jadeite and pearl-embellished gold hair pin comes from the Late Qing Dynasty, 19th Century. The decorative top is shaped like a petal. At the top-center is a jadeite bat, from which descend six natural pearls. The back is marked 田元祖斤. 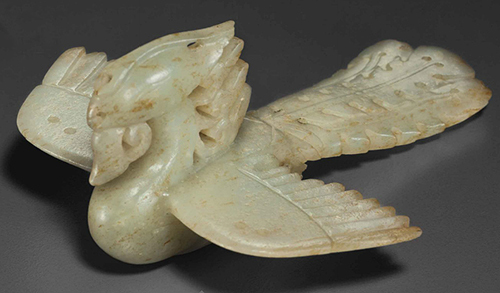 Atop this pale greenish-white jade hair pin from the Yuan-Ming Dynasty (1279-1644) is a phoenix. His head is raised, wings spread, and his tail feathers curve up on either side of his body. 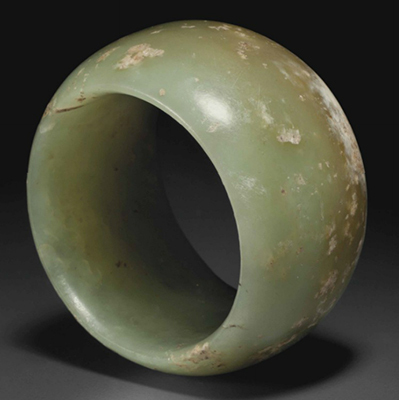 I love this olive-green jade circular hair ornament. 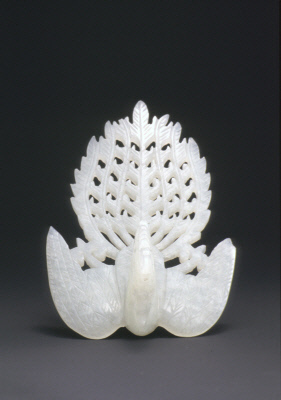 It is 2000 years old, Chinese, has convex sides, and “the semi-translucent stone has areas of ivory-colored opaque alteration at one rim.” However, the design is modern, minimalist, and elegant. I don’t think it’s easy to hand-carve a perfect circle in any age. Bonham’s is selling the Lauren Bacall Collection on 31 March 2015. 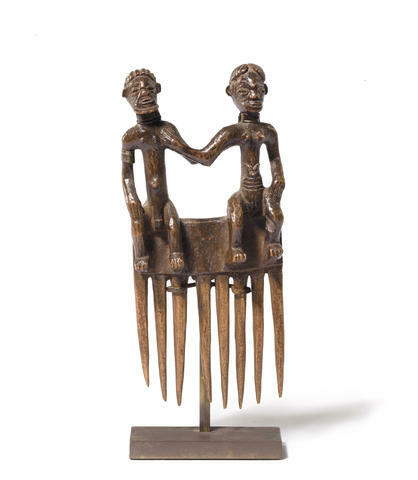 She has a Chokwe comb with a seated couple from the DR Congo. 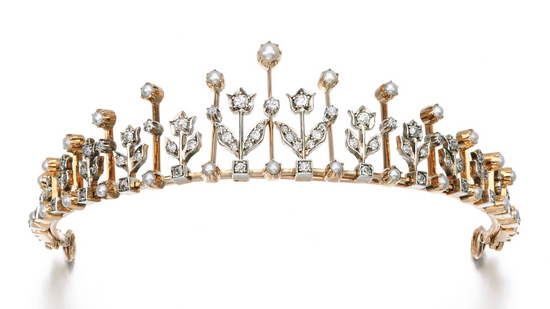 I would like guess Humphrey Bogart bought this for her when he was filming The African Queen in the Congo, in 1951. She would have kept something like this without telling anyone where it came from, and would smile every time she looked at it, because that’s what love is. At Zemanek-Münster in Würzburg, Germany, two pieces interest me. From 6 April 1994 to 16 July 1994, over 1 to 2 million Tutsis were slaughtered in the Rwandan genocide. 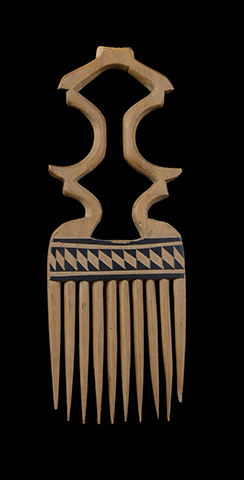 This comb is from the Tutsi of Rwanda. 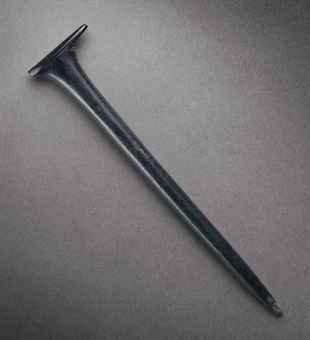 With an architecturally open design, a geometric pattern bordered in black paint delineates it from the tines. Tradition survived. 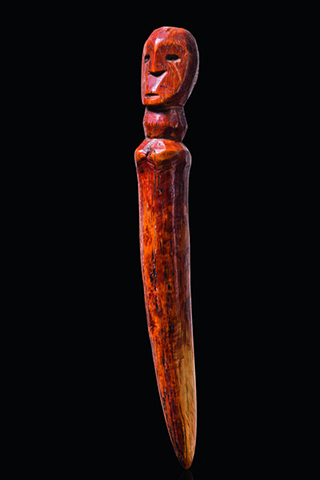 This Lega ivory anthropomorphic peg from the DR Congo would have belonged to a high-level “bwami” member. The ivory’s patina gives it multiple colors and power. Provenance: Jean-Marc Desaive, Soumagne, Belgium.